What I would give for a Barrett with one incendiary round…. @GrandAdmiralThrawn: definitely Aussie. The US DOT would never let anything like that roll around here. It needs about 10 miles to slow down. Repost, I posted that YEARS ago…. well ages anyway. Perhaps a year. 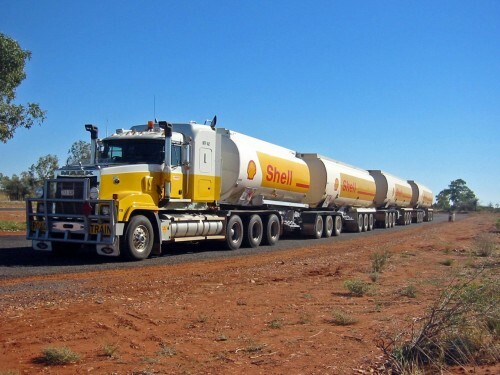 And yes, its called a “road train” and is only able to operate in certain states in Australia. @bluebec: You are correct! I saw a show on Discovery or TLC a while back on semi-trucks and they had a segment on these “road trains”. I’m Australian, I lived where these things drive, I’ve had to attempt to overtake them (its scary), I’ve easily dragged them off at the lights. I’d hate to have to drive one myself. @bluebec: What do you mean by “Iâ€™ve easily dragged them off at the lights”? You mean like drag racing? @j_bryon: In a manner. He means accelerated faster than they so as to not get stuck behind. But these bastards lumber at about 110km an hour down the long straights that inland aust is known for. Getting past them always involves a flat foot, 7 new chips in your windshield and the fervent prayer that the heat haze on the road isn’t hiding a car that is close. @Putridity: Thanks for the Australian to American translation. Additionally, I think the show that I watched on road trains showed examples of them that were even LONGER than the one show in this pic. Here’s a link to a pic of what is called the longest in Australia. This is how we roll at Shell. @benito: i will just assume you’re from usa? if that is correct i’m here to tell you that dominican republic is not small. you just lived in a continent. if you lived on island for example of 33 sq miles you would see Santo Domingo is not small. I live in Argentina. DR Is Small for road trains, they need large straight roads without stops to be effective. In a small non flat country they are useless. @benito: did a some googling and yea if it wasn’t for the mountains the road trains would have been proven very usefull. Why doesn’t australia just get an oil pipeline like alaska?